St. Abaskhiroun was born in the city of Kelen (in Kafer El-Sheikh), and was one of the soldiers of Arianus, governor of Ansena. When the Emperor Diocletian ordered all his people to worship idols, the saint refused to comply with this order. They seized him and shut him up in prison in the palace of the Governor, in Assiut. Five other soldiers agreed with him to shed their blood on the Name of Christ. Their names were: Alfius, Armanius, Arkias, Peter, and Cranius. When they came before the Governor, he cut off their girdles, tortured them, crucified some and cut off the heads of the others. As for St. Abaskhiroun, the Governor ordered him to be transported to the Governor of Ensena, where the saint was tortured with different kinds of tortures, but the Lord comforted him and healed his wounds. The Governor of Ensena then ordered that the saint be thrown in the fire. To his surprise, however, the fire did not harm the saint. Instead, the saint was seen praying and praising God in the midst of the fire. Archangel Michael then appeared to the saint, encouraged him and informed him that in four days he would join his fellow martyrs in paradise. Finally, the Governor brought a sorcerer who gave the saint some deadly poison. The Saint took the poison, made the sign of the cross over it, drank it, and no harm came upon him. The Governor became more enraged and tortured him extensively, then he ordered to cut off his head, and he received the crown of martyrdom. 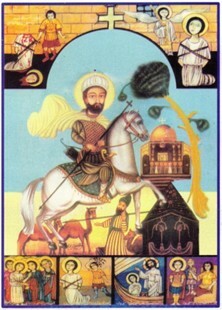 St. Abaskhiroun is famous for a great miracle when he moved his church, with all the people praying in it, from Keleen to the village of El-Beho in Upper Egypt. While the Christian congregation was attending a wedding ceremony in the church of St. Abaskhiroun, some evil-doers surrounded the church and wanted to kill everyone inside. The congregation asked for the intercession of Abaskhiroun, who transported the church, in a miraculous way, to the village of El-Beho. The church celebrates his feast on June 14. May his prayers be with us all Amen.